Prepare grill for direct grilling. Preheat to high heat. Divide pizza dough into two portions and flatten into rectangles on a lightly floured surface. Let dough rest for five minutes, then flatten and reshape as necessary. Using a pair of tongs, dip a paper towel in olive oil and brush grill grates. Slide the pizza dough onto grill grates over direct heat. Close grill cover and cook for 2 to 3 minutes, the dough will begin to bubble. When dough is crisp and browned on the bottom, remove from grill and place grilled side up on a baking sheet. Reduce grill heat to medium and close the grill. Brush the top of the pizza dough lightly with olive oil. Layer the tomatoes on each of the pizzas, season with salt & pepper and sprinkle with half of the cheese. Carefully slide back onto the grill. Close grill and cook for another 2 to 3 minutes, until crust is browned and cheese is melted. 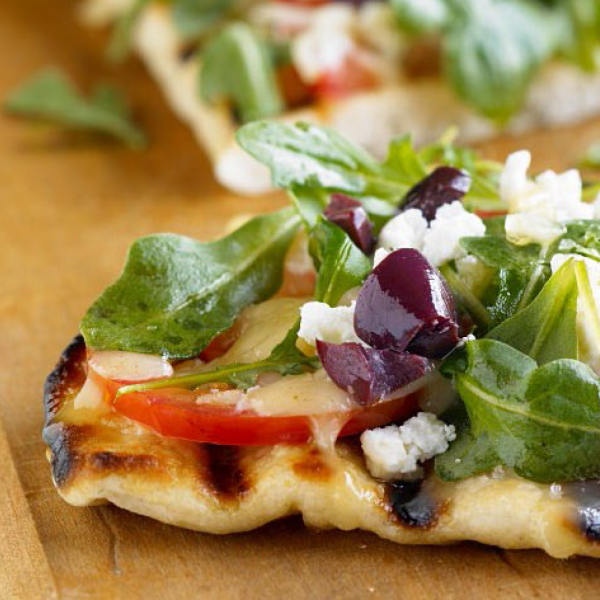 Using a spatula, slide pizza off the grill onto a cookie sheet or a wooden cutting board. Top with arugula, shaved beets and the remaining cheese. Serve immediately.